There are 3 videos in this series and they have statements by 150 academics and scientists and I hope to respond to all of them. Wikipedia notes Theodor Wolfgang Hänsch (born 30 October 1941) is a German physicist. He received one fourth of the 2005 Nobel Prize in Physics for “contributions to the development of laser-based precisionspectroscopy, including the optical frequency comb technique”, sharing the prize with John L. Hall and Roy J. Glauber. 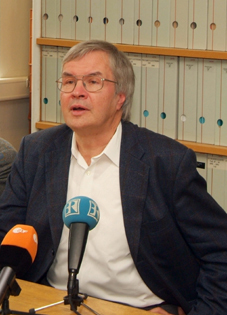 Hänsch is Director of the Max-Planck-Institut für Quantenoptik (quantum optics) and Professor of experimental physics and laser spectroscopy at the Ludwig-Maximilians University in Munich,Bavaria, Germany. Hänsch gained his Diplom and doctoral degree from Ruprecht-Karls-Universität Heidelberg in 1960s. Subsequently, he became a professor at Stanford University, California from 1975 to 1986. He was awarded the Comstock Prize in Physics from the National Academy of Sciences in 1983. In 1986, he received the Albert A. Michelson Medal from the Franklin Institute. In the same year Hänsch returned to Germany to head the Max-Planck-Institut für Quantenoptik. In 1989, he received the Gottfried Wilhelm Leibniz Prize of the Deutsche Forschungsgemeinschaft, which is the highest honour awarded in German research. In 2005, he also received the Otto Hahn Award of the City of Frankfurt am Main, the Society of German Chemists and the German Physical Society. In that same year, the Optical Society of America awarded him the Frederic Ives Medal and the status of honorary member in 2008. His comments can be found on the first video and the 37th clip in this series. Below the videos you will find his words. I grew up at Bellevue Baptist Church under the leadership of our pastor Adrian Rogers and I read many books by the Evangelical Philosopher Francis Schaeffer and have had the opportunity to contact many of the evolutionists or humanistic academics that they have mentioned in their works. Many of these scholars have taken the time to respond back to me in the last 20 years and some of the names included are Ernest Mayr (1904-2005), George Wald (1906-1997), Carl Sagan (1934-1996), Robert Shapiro (1935-2011), Nicolaas Bloembergen (1920-), Brian Charlesworth (1945-), Francisco J. Ayala (1934-) Elliott Sober (1948-), Kevin Padian (1951-), Matt Cartmill (1943-) , Milton Fingerman (1928-), John J. Shea (1969-), , Michael A. Crawford (1938-), Paul Kurtz (1925-2012), Sol Gordon (1923-2008), Albert Ellis (1913-2007), Barbara Marie Tabler (1915-1996), Renate Vambery (1916-2005), Archie J. Bahm (1907-1996), Aron S “Gil” Martin ( 1910-1997), Matthew I. Spetter (1921-2012), H. J. Eysenck (1916-1997), Robert L. Erdmann (1929-2006), Mary Morain (1911-1999), Lloyd Morain (1917-2010), Warren Allen Smith (1921-), Bette Chambers (1930-), Gordon Stein (1941-1996) , Milton Friedman (1912-2006), John Hospers (1918-2011), Michael Martin (1932-).Harry Kroto (1939-), Marty E. Martin (1928-), Richard Rubenstein (1924-), James Terry McCollum (1936-), Edward O. WIlson (1929-), Lewis Wolpert (1929), Gerald Holton (1922-), Martin Rees (1942-), Alan Macfarlane (1941-), Roald Hoffmann (1937-), Herbert Kroemer (1928-), Thomas H. Jukes (1906-1999), Glenn Branch, Geoff Harcourt (1931-) and Ray T. Cragun (1976-). My response to Dr. Hansch’s statement is very similar to my earlier responses to Roy Glauber, Leonard Susskind, and Alan Guth. This exact quote “Naturally all things around us look like they have been designed intelligently. So the principles that led to their being of course in some ways implies some intelligence but it may not be the intelligence in a person like being, but intelligence is it’s own. In it’s own mechanism, how nature evolves…” made me think of you when I read the book Charles Darwin: his life told in an autobiographical chapter, and in a selected series of his published letters because of what Darwin said on this same issue of intelligent design. I am going to quote some of Charles Darwin’s own words and then include the comments of Francis Schaeffer on those words. I have also enclosed a CD with two messages from Adrian Rogers and Bill Elliff concerning Darwinism. « Visiting with Coptic Christians at Orlando First Baptist on 2-21-15!!! !